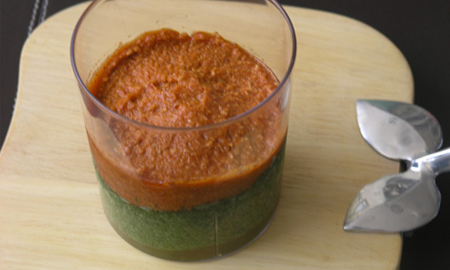 A very original idea to present some spinach as a starter utilitzando our Organic Romesco Sauce. We clean the spinach well and cut small, cook them in a wok for 5 minutes. I grind with a blender, let it cool. While assemble the egg whites until stiff with a pinch of salt. Mix well the egg whites with chopped spinach, put it in cups or glasses. Let stand 6 hours in the refrigerator. Once past these hours, do a second layer with romesco sauce. I turn to cool in the fridge for a couple of hours. It is an amazing vessel, the “life” that is offset by the spinach sauce that usually are more “bland”.